Large selection of Kraft wrapping Paper available. Our Virgin Kraft Paper Rolls are the highest quality available. Black Kraft paper is the choice for framers to use. Try our brand new colors in Kraft Paper, Red Kraft, Yellow Kraft and Blue Kraft paper. 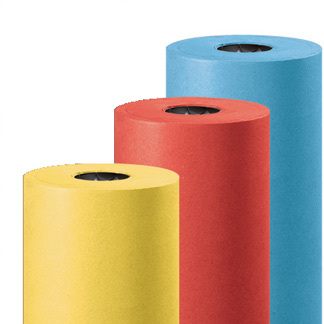 The Cellulose wadding paper is highly absorbent and idea cushioning for many products. 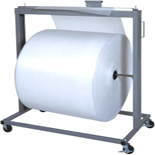 We have economical packing tissue paper, newsprint in rolls and sheets and other value wrapping products. We have chosen these products to help make your production area more efficient. Each has been tested extensively for use with many types of material. If you are unsure...give us a call and we'll recommend the very best product for your needs. 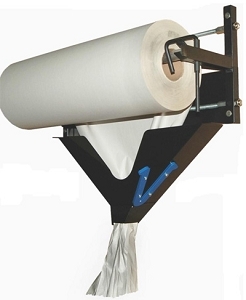 White Butcher Paper, Freezer paper, versapak, kimpak, Tissue wrap, Packing Tissue, Packing newsprint, Newsprint rolls, Newsprint sheets, Padded Movers Blankets, Paper Movers pads, PAPER CRUMPLING DEVICE, PAPER CRUMPLER, kraft paper sheets, colored kraft paper, kraft paper in colors. 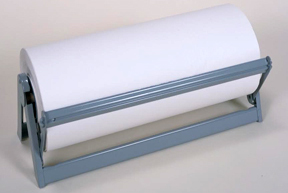 Papel blanco de carnicero, papel Congelador, Versapak, kimpak, envoltura de tejido, tejido de embalaje, papel de periódico de embalaje, rollos de papel para periódicos, hojas de papel de periódico, acolchados Movers Mantas, cojines Movers papel, papel arrugado DISPOSITIVO, PAPEL CRUMPLER, ojas de papel kraft, papel kraft, de color kraft papel en colores.Yellow kraft wrapping paper, Blue Kraft wrapping paper and Red Kraft wrapping paper.Papel de embalaje kraft amarillo, azul Kraft papel de regalo y Red Kraft papel de envolver.